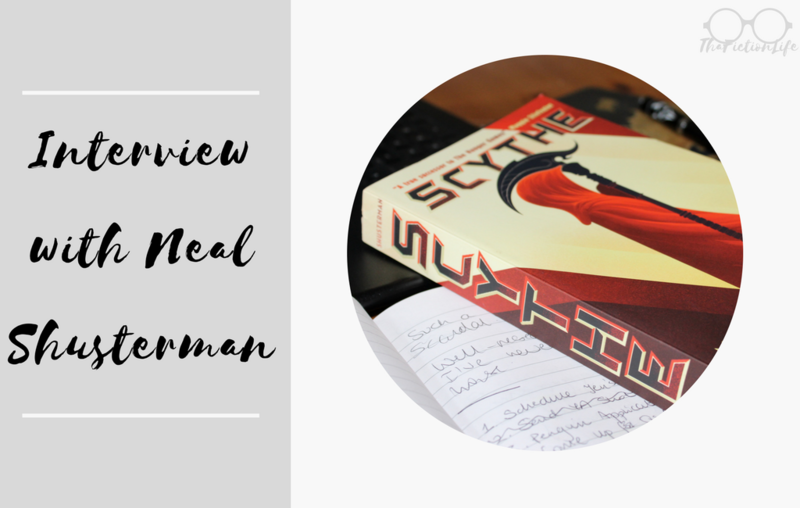 I am so pleased to introduce Neal Shusterman today, the author of the Arc of a Scythe series to That Fiction Life. 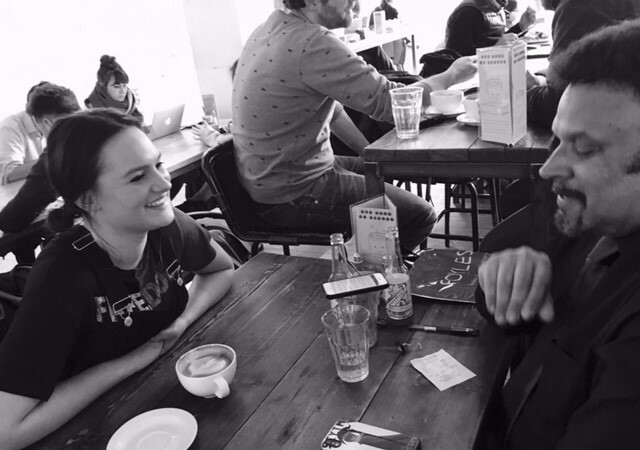 We sat down in the stunning Foyles Cafe in London to discuss all things Scythe, writing processes, inspirations and character development. Having read book one in the series last month I had an abundance of questions to further learn about the series. It was incredible to also sit down with Neal for a video interview for my YouTube channel, where we even sorted his characters into Hogwarts houses! After reading the following chat, make sure to watch the video right at the bottom. Scythe is available now from the links below and make sure to pre-order Thunderhead, book two! To begin with, where did you get the idea for the Arc of a Scythe series? I've written four books in my previous YA series, which came out the same year as the Hunger Games and at that time teen dystopia became its own genre. 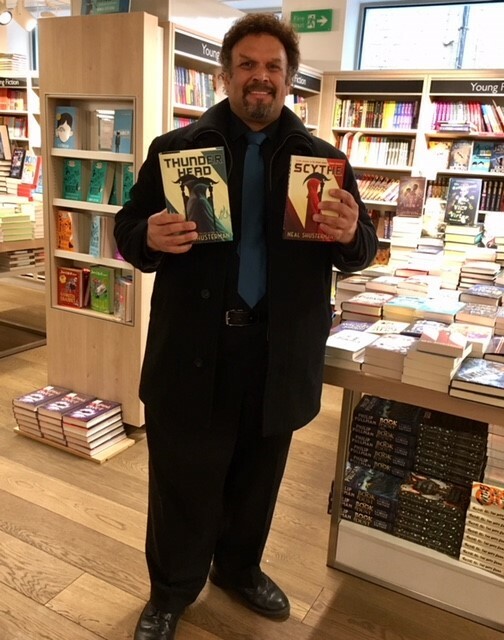 When it came time for me to write another series I knew I wanted to write a futuristic story but I didn't want to write just another dystopian story. I wanted something different so I thought about how in those stories the world went wrong, well what happens when the world goes right? I mean a world without war, a world without poverty…we are conquering diseases left and right. We want to get rid of them. So what happens when we do? 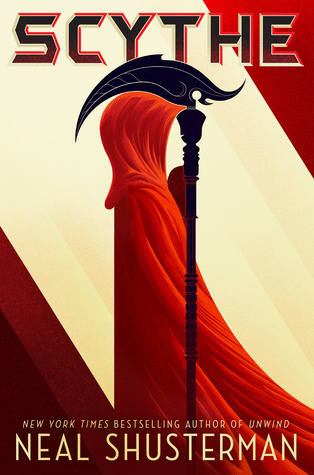 In Scythe we've extended life to the point where we can live forever, but there are consequences to that. One of them is overpopulation. I thought in this perfect world how do we deal with the fact that we've stolen death from nature now that we've stopped the aging process. How do we decide who lives and dies? In dystopians governments decide - that's not good, or computers decide - that's not good either. You have the Matrix and Terminator showing all evil computers and I thought what if it's like the Jedi? The wisest and most ethical, are given this honorable task of deciding who lives and dies and they do it with absolute passion and understanding. That's where the idea started and I knew I wanted the story to feature teenagers. There is a scythe who takes on two teenage apprentices and these kids don't really want this. That's really the first rule to becoming a scythe, if you want to kill people you don't deserve the job. They have to learn the art of killing with compassion and understand that this is something that society needs them to do. Did you always intend to have two teenagers as apprentices? I always wanted a girl and a boy, I wanted to show it from both a boys and girls point of view. It also gave me the opportunity to take the story in different directions, by going back and forth between them. I could do more with it if I was following two characters. Because there are simultaneous plot lines going on at the same time, was it difficult to keep up with the plot? Did you plan it all beforehand? When the story starts getting really complex, I have a spreadsheet for each chapter so I can see if we've been with Rowan for three scenes maybe it's time to switch to Citra or to go to Faraday here so it's evenly divided. You’re not a spontaneous writer then? Well I always plot but the story changes as I'm writing it. Things happen. For example when I started writing, Citra and Rowan were not put into the position of having to glean the other. When I was at the Conclave and Goddard was there, I thought he would throw a monkey wrench into this. He's so manipulative and so good at tweaking things - what would he do to mess up Faradays intentions with these kids. I realise he would make it a life or death competition. Make it more fiendish than it already was! Yes, exactly. And then how do the characters deal with it? So the story took a new direction when it happened and I had not planned that out. You know one of the best things about writing is discovering what you didn't already know when plotting. Then you realise that's what has to happen, it keeps it feeling too predictable because it's taking on directions you didn't expect it to. Did that happen when writing Thunderhead too? 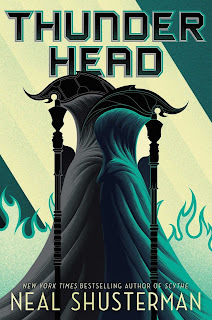 Yes a few things did sneak up on me when writing Thunderhead. There would be spoilers if I told you what they were but there were a number of things that were surprising to me. It was one of those things were you say oh I can't do that, can I do that? Oh I have to do that. Did you have trouble developing any characters or did they come easily to you? They grow as I'm writing them. I didn't have any trouble with the characters in this book, once they feel like real people, it feels like I'm just transcribing their lives and writing what they're going through. Is there a difference for you in writing first drafts and revisions? Do you prefer one over the other? Well the first draft is always easier. It's all a stream of consciousness. You're not so worried about the problems because you don't notice them. The editor will find the problems.. A bad editor will say this is bad, which doesn't help you, a good editor will say “this isn't working and here's why”. Once you know what the problem is you can fix it and so that's the hardest part, identifying it in the first place. Revisions are harder as you need to think about changes, which can affect everything in the story. Do you often cut out scenes that you wish could have stayed when self-editing? There are scenes that will happen but the story ends up going in a different direction so they’re no longer relevant or they are slowing the story down. The way that I deal with that is rather than deleting it I have a side file for those scenes. So they’re still there. Maybe for a later chapter in the book or series. Has your writing process changed when writing this series? Actually not really it's been the same for a long time. I write longhand and in a notebook, I don't start on a computer for a couple of reasons. First of all, I write for a long time so if I write on a computer I'll be on it all the time. I'm also able to vary my writing and I like to use a fountain pen for that. And the main reason is that it's just a stream of consciousness and I don't figure out how it fits together until I type it in as that's when I’m structuring it and improving it. So I'm already on a second draft of a chapter as I'm typing it in; it's a step further along. That's been the process I've used since the beginning. 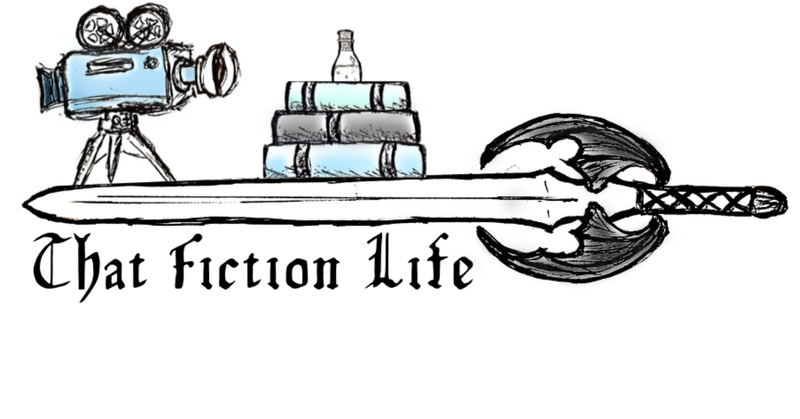 Every writer has their own way of doing it, I have friends who don't write linearly, they write whatever the feel like writing in the story and eventually it fits together. I've tried that and I can't do that, I have to write in order, so even if there's a really exciting chapter I want to get to, it's not coming for another 50 pages. I won't write it until I work my way to it. There's going to be three books in this series, do you know how it's all going to end? I think I know how it's all going to end. I don't close myself off to better ideas along the way but at this point I think I know but that could still change. Do you share any personality traits with the characters? I think with all of them. Writing is a little bit like acting, you can't help but put a little bit of yourself into every single character. I always tell people if you want to know who I am, read my stories, I'm in all of the characters, even the bad ones. Thank you to Neal for speaking to me and to Walker publishing for making this possible, spending the day with an author is a book bloggers dream so excuse me while I try to wake up from this daydream! No way!! Neal Shusterman is one of my all-time favourite authors and I'M SO JEALOUS.